On 24 November, Precarpathian University hosted a National Contest in Polish Orthography under the auspices of the Embassy of Poland in Ukraine. The event is held for the 14th consecutive year. This year, approximately fifty students from twenty-two higher educational institutions participated in the contest. The event was organized by Precarpathian University, the Centre for Polish Studies at Precarpathian University, the Department of Slavic Languages at Precarpathian University, Jakub of Paradyż Academy in Gorzów Wielkopolski (Poland). The opening ceremony was attended by Dr. Ihor Tsependa, the University President; associate professor Olena Pelekhata, director of the Centre for Polish Studies at Precarpathian University; Dr. Elżbieta Skorupska-Raczyńska, head of the jury, habilitated doctor, rector of Jakub of Paradyż Academy in Gorzów Wielkopolski (Poland); Halyna Ukhto, doctor, advisor to the University President on international cooperation, director of the Centre for Ukrainian Studies; Przemyslaw Slowinski, vice-rector for student affairs at Jakub of Paradyż Academy in Gorzów Wielkopolski; Emiliia Yasiuk, advisor on science and education at the Embassy of Poland in Ukraine. “The contest in Polish orthography, which is supported by the Embassy of Poland in Ukraine for the 14th consecutive year, is a good opportunity for Ukrainian students to improve their knowledge of Polish. Also, it is good practice for them. I am grateful to Precarpathian University for the long years of support in organizing the contest, “ said Emiliia Yasiuk, advisor on science and education at the Embassy of Poland in Ukraine. After the opening ceremony, the contestants wrote a dictation for 30 minutes. The text was read by its author – head of the jury Elżbieta Skorupska-Raczyńska. “I write dictation texts myself. Every year a dictation text is concerned with a different topic. However, it always describes some events happening in the Precarpatian Region. This year it was about research cooperation between Polish and Ukrainian universities, “ said the head of the jury. 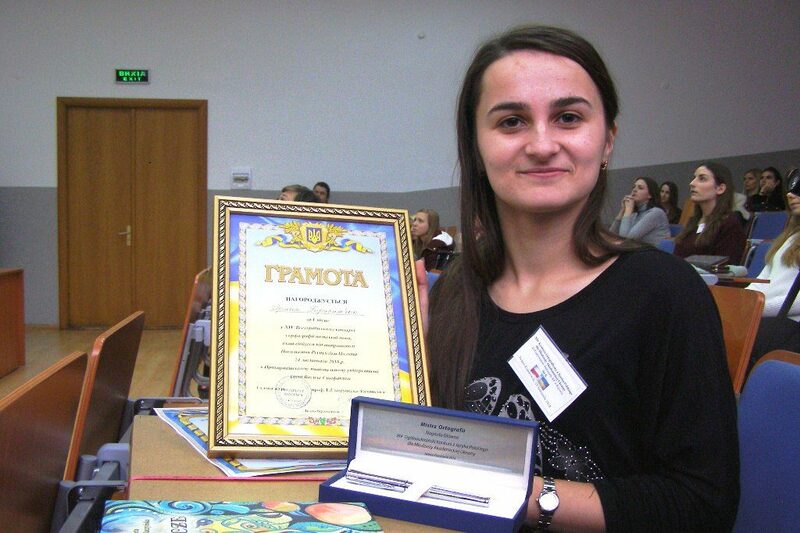 Iryna Herasymiuk, a fourth-year student from Precarpathian University who majors in Polish Language and Literature, became the winner of the XIV Ukraine’s National Contest in Polish Orthography. The student was prepared for the contest by Mariana Skrypnyk, who teaches at the Department of Slavic Languages. The second prize was won by Alina Marchenko (Kyiv National Linguistic University) and Khrystyna Harvat (Vasyl stefanyk Precarpathian National University). The third prize was given to Olena Mazepa (Ivan Franko National University of Lviv), Olena Romaniv (Lesya Ukrainka Eastern European National University in Lutsk) and Khrystyna Yatsyshyn (Drohobych State Pedagogical University).